In chemistry, a multi-component reaction (or MCR) is a chemical reaction where three or more compounds react to form a single product. By definition, multicomponent reactions are those reactions whereby more than two reactants combine in a sequential manner to give highly selective products that retain majority of the atoms of the starting material. 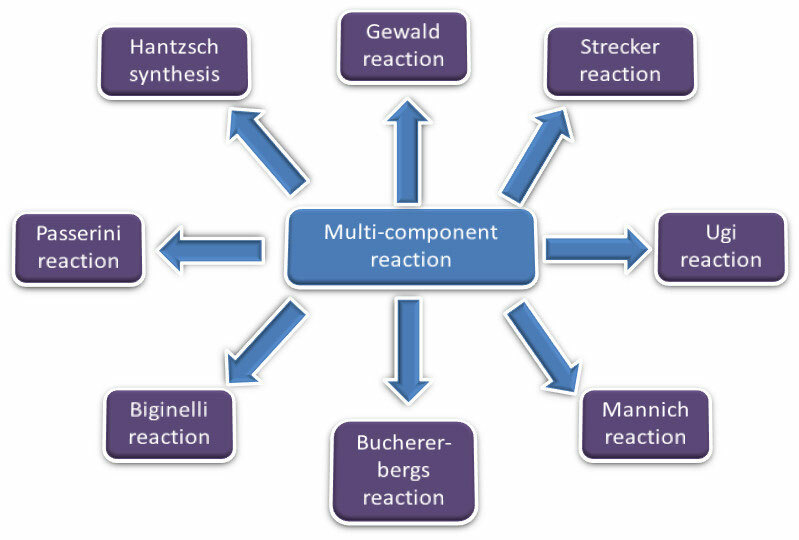 Multicomponent reactions have been known for over 150 years. The first documented multicomponent reaction was the Strecker synthesis of α-amino cyanides in 1850 from which α-amino acids could be derived. A multitude of MCRs exist today, of which the isocyanide based MCRs are the most documented. Other MCRs include free-radical mediated MCRs, MCRs based on organoboron compounds and metal-catalyzed MCRs. Isocyanide based MCRs are most frequently exploited because the isocyanide is an extraordinary functional group. It is believed to exhibit resonance between its tetravalent and divalent carbon forms. This induces the isocyanide group to undergo both electrophilic and nucleophilic reactions at the CII atom, which then converts to the CIV form in a exothermic reaction. The occurrence of isocyanides in natural products has also made it a useful functional group. The two most important isocyanide-based multicomponent reactions are the Passerini 3-component reaction to produce α-acyloxy carboxamides and the Ugi 4-component reaction, which yields the α-acylamino carboxamides.